Lennon had the Phantom V customised in true rock-star style. The rear seat was converted to a double bed, a television, telephone and refrigerator were installed, along with a ‘floating’ record player and a custom sound system (which included an external loud hailer). Then, in April 1967, just as the recording of the game-changing Sgt. 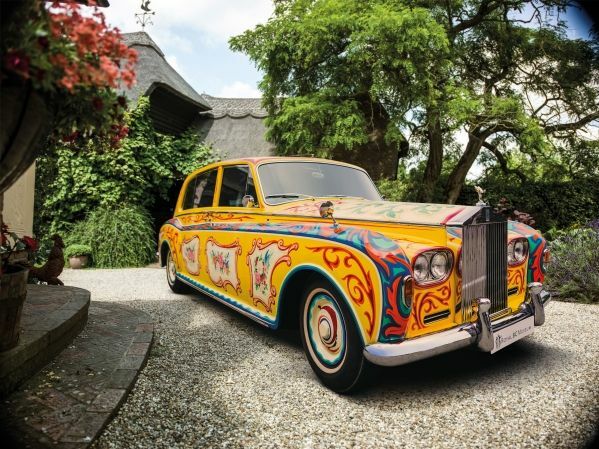 Pepper’s Lonely Hearts Club Band was finishing, Lennon asked Surrey coachbuilders, JP Fallon, to give the Phantom a new paint job. The freshly-painted Phantom was unveiled days before the worldwide release of Sgt. Pepper’s on 1 June and it seemed part of the overall concept of the album.